Here’s the Friday preview: Bainbridge edition for Oct. 12. Please feel free to give your own events a plug in the comment section below. Read the Sun’s regional Friday preview here. Above, look at this picture from Monday at Fay Bainbridge. Now look out your window. Miss summer yet? Weather: Our mini-drought is coming to a drippy end. According to the National Weather Service, rain is likely this afternoon. And Saturday. And Sunday. 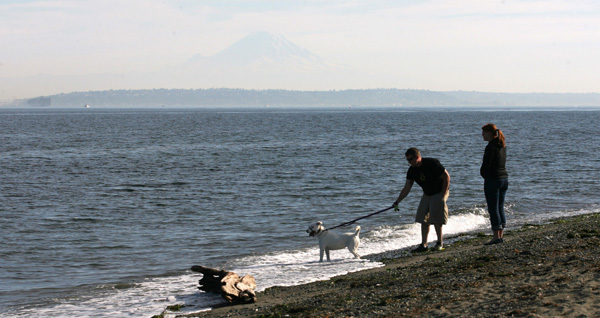 Temperatures will hover between 50 and 60 degrees. Sports: It’s a very quiet weekend for Spartans sports. Volleyball is back in action Monday at Eastside Catholic, after notching a big win against Seattle Prep this week. The full Spartans schedule is online. The Pinball Wizard comes to Bainbridge. The Who’s “Tommy” debuts tonight at Bainbridge Performing Arts with an opening night reception starting at 6:30 p.m. Information here. Bainbridge Fire hosts a pancake breakfast and fire truck rides from 8 a.m. to noon Saturday at the headquarters station on Madison Avenue. Bloedel Reserve will burst with activity this weekend. Traveling photo exhibit “The Owl and the Woodpecker in Washington” alights at the north island estate Saturday, a show that continues through November. Bloedel also invites children for a Super Squash Scavenger Hunt, which runs Saturday through Nov. 30. 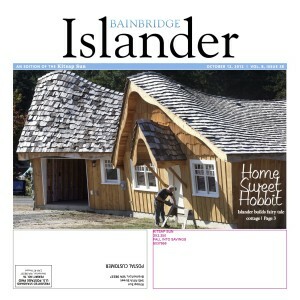 Inside the Islander: Our story of a hobbit-like house on Bainbridge drew attention from a few local and national outlets. Builder Chris Whited said he was surprised to even see it on the Sun’s A1. “I figured the front cover was reserved for escaped convicts and politicians,” he said in an email. “Pumpkin Pie” and “Swamp Monster” were the big winners of the Poultry Pageant. We visited three island gardens donating to Helpline House food bank. On Monday, we received a visit from an envoy of orcas representing all three resident pods. See photos here and here. The city decided Wednesday to stop charging stormwater fees to its roads. Two brothers are rebuilding their dream of a Bainbridge goat creamery following a September fire.